Most shows bounced back from last week’s Halloween blues. ABC: THE GOLDBERGS climbed 0.3 to 1.3, while AMERICAN HOUSEWIFE and MODERN FAMILY were both up 0.2, respectively to 1.1 and 1.4. SINGLE PARENTS edged up 0.1 to 1.0. A MILLION LITTLE THINGS was the exception, down 0.1 to 0.7. CBS: SURVIVOR rose 0.3 to 1.6, and both SEAL TEAM (0.9) and CRIMINAL MINDS (0.8) were up 0.1. NBC: CHICAGO MED (1.2) and CHICAGO FIRE (1.3) were each up 0.1, and CHICAGO PD was steady at 1.1. FOX: EMPIRE gained 0.3 to 1.5, and STAR was up 0.2 to 1.1. 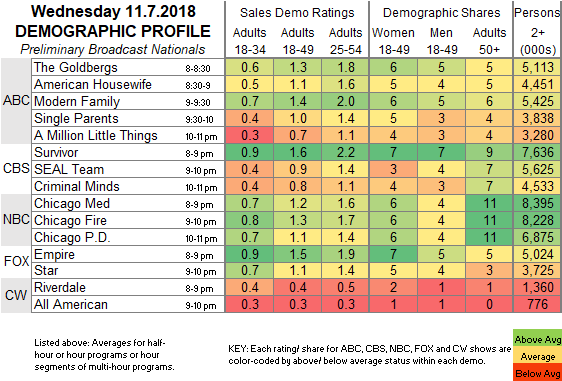 CW: Returning after a rerun week, RIVERDALE lost 0.1 to 0.4 compared to 2 weeks ago, and ALL AMERICAN was steady at 0.3. 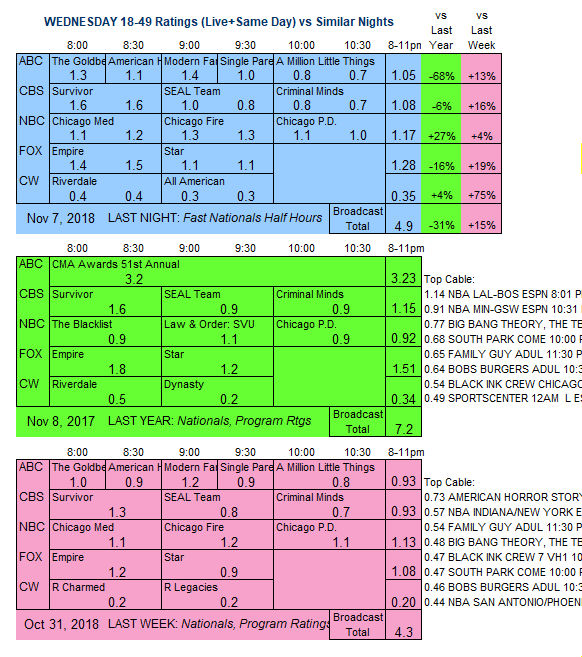 The broadcast networks air their regular line-ups tonight.